This book invites you to hear what Christian theology has to say to the contemporary world. Christian theology is the creature of the Church, and the Church is the creature of God. When the Church lives out of the tradition it has received, and passes on the good things of that tradition, it has something to say about the world. It speaks theologically when it offers coherent and public talk about God and man. The Church has a more generous definition of the world than our contemporary world has of itself. Theology has a more sophisticated idea of time than does the surrounding world. It talks about time in order to say that the world is not yet settled, and will not be settled until it is established in relationship with God. We raise the subject of time to draw our attention to the way things come and go, and to remind us to be realistic in estimating what we know about them. Eschatology is the Church’s term for this form of self-control. “No attentive reader of this book can fail to be impressed by its scope, boldness and sheer theological energy. As he moves across the fields of historical and systematic theology, biblical studies, and philosophy, Knight demonstrates the resources within the Christian tradition for critical analysis and hopeful reconstruction of culture. This provocative book deserves to be read and debated very widely.�? “Dense, erudite, and provocative, this work confirms the vitality of British, indeed, European doctrinal theology. This is fundamental theology in the best sense, investigating the unity of thought and practice, language and reality, faith and politics, and doctrine and worship in the activity of the triune God. The reader opening to any page will be rewarded with startling and original theological insights. �? Read this book…wrestle with this book…please, please, take your time with this book. This book is rocket-fuel. This book wants to teach you precisely how classic Christian theology interrogates and soars above so much that is stale and dispiriting in modern thought, particularly in modern political philosophy and, more generally, in all the humanities and social sciences. This book is an invitation to intellectual freedom and genuine creativity in the service of God. “Douglas Knight is a free-flowing fountain of unexpected ideas and connections. Consider only the title of this book: everyone one of the pairings does conceptual work, including those made by the chiasmus.�? 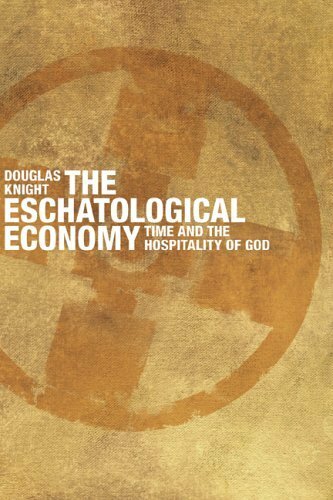 “Ambitious, creative, and challenging, Douglas Knight combines a rigorous and scripturally disciplined dogmatic approach with fundamental analysis of metaphysical concepts. The result is an exciting and theologically motivated challenge to our modern assumptions about time and change, embodiment and identity.�? Knight has produced an ambitious, engaging, and creative account of the drama of redemption by changing the base-line terms in the discussion. This is constructive theology of a bold and fresh kind, taking seriously Israel, sacrifice, and an account of the problem of the human condition indebted to Irenaeus and Zizioulas. It is remarkable for its timely account of our present destiny as the Church, in the world of God’s constant, caring, and consummative work. “In the tradition of Irenaeus’ Against Heresies and in conversation with leading theologians and biblical scholars from across our confessions, this tour de force tells a grand narrative of all things coming together and coming to be in Israel, Jesus Christ, and his Church. Douglas H. Knight displays an impressive imagination for pulling together a dizzying variety of voices. This is a book of Christian theology. Theology is what the Church does when it checks that it is fully expressing and passing on the word it receives from God. This book relates our understanding of time and history to Christian theology, to conform our understanding of ourselves to the theological truth that God is changing us. Sanctification is the term the Christian tradition uses for the process of our transformation. In this book I connect the concepts of paideia, our formation, and the doctrine of sanctification. It is a very old theme in Christian theology, associated with Irenaeus, that God always intended come to man and stay with him, and that in the course of this coming, man would grow up, a process delayed, but not halted, by sin and rebellion. This book discusses the ways in which Christian doctrine and biblical studies tackle this issue of the education or formation of humanity, and in particular the role of the people of Israel in this. It explores the relationship of sacrifice, along with other models of the work of Christ, to sanctification, and it re-examines the connections between Israel, Jesus Christ, time, history and Scripture, by closely linking them to the Christian doctrine of God. This book compares the Christian view of who we are with other modern views. It suggests that modern thought, ever ready to take things apart but unable to put them together again, creates intellectual divisions which give us a series of partial, and so defective, understandings of who we are. In this book I suggest that the trinitarian doctrine of God alters the way we understand secularisation and the world of modernity, and avoids the tunnel vision that determine modern existence. To do this, this book makes some proposals about the relation of theology to the world.